Ménière’s disease is a disorder of the inner-ear that causes abnormal sensory perceptions, including disabling vertigo, hearing loss, and ringing, usually in one ear. It is more commonly seen in people over the age of 40, and an estimated 45,000 individuals are diagnosed each year. The National Institute on Deafness and other Communication Disorders (NIDCD) estimates that 615,000 individuals have been diagnosed with Ménière’s disease in the United States. Ménière’s symptoms tend to occur suddenly and can arise daily or as infrequently as once a year. They consist of intermittent disabling vertigo (the very unpleasant sensation of things spinning around you, often accompanied by nausea and loss of balance), tinnitus (ringing in the ears), fluctuating hearing loss, and a feeling of fullness, pressure, or pain in the affected ear. Episodes of vertigo usually begin without warning and can last from 20 minutes to two hours or more. 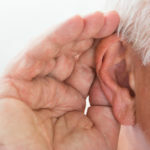 Hearing loss may wax and wane especially early in the course of the disease, but eventually most people experience some degree of permanent hearing impairment. No one knows what causes Ménière’s disease, but the attacks themselves are believed to stem from changes in fluid volume in the membranous labyrinth, a section of the inner ear that is responsible for maintaining balance and orientation of the body in space. The body is constantly making and absorbing the fluid in this delicate system, and any process that increases fluid production or hinders absorption can cause imbalances in fluid pressure that send conflicting signals to the brain. Many factors can affect how often symptoms appear and how severe they may be. Excessive salt intake seems to make Ménière’s disease worse by causing extra fluid retention in the inner ear. Other factors that can influence Ménière’s include stimulants such as caffeine and tobacco, which worsen symptoms. Stress-related hormonal changes can also lead to fluid retention and worsen Ménière’s symptoms. What is the conventional treatment? Unfortunately, there’s no reliable cure for Ménière’s disease. Controlling the level of salt in your body can indirectly influence the amount of fluid in the inner ear canals. By modifying dietary salt intake, one can help reduce fluid retention and consequently decrease pressure in the inner ear. Dietary modifications are summarized below. Conventional treatments include diuretics such as triamterene and hydrochlorothiazide (Dyazide, Maxzide) that affect overall fluid retention. These can often help control the severity and frequency of attacks. Anti-nausea or anti-vertigo medications may also offer symptomatic relief during episodes. Several procedures have been developed to help treat severe cases of Ménière’s disease. They involve injections of medications such as gentamycin (an antibiotic toxic to the inner ear) and dexamethasone (a steroid) into the middle ear where they are then absorbed into the inner ear. Other methods involve surgical procedures, where one of the inner chambers in the membranous labyrinth – the endolymphatic sac – is decompressed by removing a small piece of bone over it and then placing a small shunt there to help drain off excess fluid from the inner ear. These procedures can be effective, but all of them carry a risk of permanent hearing loss and should only be done when conservative treatments have been exhausted. In very severe instances where hearing has already deteriorated, the entire semi-circular canals of the labyrinth are removed. What therapies does Dr. Weil recommend for Ménière’s Disease? Nutrition and Lifestyle: You may be able to reduce the frequency and intensity of attacks by reducing fluid retention in the body via a low-salt diet. Your goal is to limit salt to 1,000 to 1,500 mg or less of sodium per day. Avoid packaged or processed foods, canned soups, frozen meals, lunch meats, jerky and salted nuts as well as foods high in monosodium glutamate (MSG), often found in Asian foods. Eating regular, small meals throughout the day can also help regulate fluid status in the body. You may also be able to lessen the severity of symptoms by giving up smoking. Mind/Body Medicine: Learning methods to reduce stress, such as practicing breathing techniques, biofeedback, hypnosis or guided imagery can be effective in managing symptoms. These techniques may also help with smoking cessation. Supplements: You also might try taking ginkgo biloba, which appears to increase blood flow in the head and peripheral areas. The dosage is two capsules three times a day for two months as a trial. Other Therapies: Dr. Weil recommends cranial osteopathy, a form of manual medicine in which practitioners use their hands to adjust the body mechanically so that breathing is unrestricted, the nervous system functions more smoothly, and fluids move better in the head. You can find a qualified practitioner in your area by visiting www.cranialacademy.org and clicking on “Find a Professional.” Acupuncture may help, as well, as may postural approaches such as yoga, the Feldenkrais Method, and the Alexander Technique, all of which can help relieve chronic muscular tension in the head and neck that may be interfering with normal circulation. Can Diet Prevent Hearing Loss? Can Noise Cause Permanent Pain? Can Noise Make You Sick?